Another ‘Group Giving Day’ took place over at Leyland Masonic Hall, Wellington Park and this was to be the ninth year in succession in which the group had organised such an event. There were over 20 local charities represented on the day which turned out to once more be a very humbling and public occasion for all concerned. Pictured from left to right, are: Raymond Cookson, Tom Oakes, Hayley Jackson (receiving the cheque for St Catherines Hospice), Ian Heyes, Elizabeth Bridge, Chris Hughes, Eric Nixon and Bryan Hoarty. Chairman of Leyland and District Group Chris Blackwell welcomed the Mayor of South Ribble Councillor John and Mrs Shirley Rainsbury to the annual event. He thanked the Mayor for his attendance as this was one of his first official appointments in what would prove to be a very busy schedule. Chris introduced some of his colleagues who were taking part; Stewart Seddon (Assistant Provincial Grand Master), Mike Pinckard (group vice-chairman), Dave Bishop (group secretary), John Wrenall (Regional Charity Steward and Jeff Lucas (Leyland Group Charity Steward) who had organised the day along with his assistant John Anderson. Stewart Seddon set about welcoming the guests by giving a brief introduction about the organisations history and charitable giving background. He briefed the audience about Elias Ashmole, founder of the Ashmolean Museum at Oxford and how he wrote in his diary about becoming a Freemason in October 1646, through to the forming of United Grand Lodge in 1813 – the first Grand Lodge having been formed in 1717 in London. Since the last ‘Group Giving Day’, across the Province of West Lancashire both national and local charities Masonic and non-Masonic have benefitted from approximately £265,000 from both Craft and Mark Freemasons, including the Grand Charity. Stewart presented a breakdown of Leyland Group’s contribution to the total which saw £12,142 being donated by the Leyland Group of Freemasons to non-Masonic charities and £12,220 being donated to Masonic Charities, a grand total of £24,362. He continued by announcing the recipients, together with the donations to be received by each of the charity representatives. Pictured left from left to right, are: Neil Ward, Leanne Corless (receiving the cheque for Lancashire TAAG) and Ian Hainsworth. Pictured right: Mike Pinckard, Kevin Balyckyi (receiving the cheque for The Lewis Balyckyi Trust Fund) and Stephen Lunt. The first three presentations were to charities that could not be present on the day; Macmillan Nurses were awarded £300 courtesy of the Red Cross of Constantine Hesketh Conclave and Lisa Martin of the charity had sent on their thanks and best wishes to all. Next was the RNLI. Earlier this year it came to notice that the institution was some way short of reaching its target for the supply of a new lifeboat at St Annes. Here the West Lancashire Mark Charity took this on and immediately set about addressing the problem. They set aside £20,000 and petitioned the central Mark Benevolent Institution to assist. The MBI put in a further £80,000 to enable the purchase to go ahead for the new lifeboat at St Annes and on 14 April the ceremony of naming and dedication took place. In the absence of a RNLI representative, Jeff Lucas received a cheque for £200 from John and June Sidgreaves of White Hills Lodge No 5209. The next recipient was Myeloma UK, (Maggies at Oldham Hospital), to which De Bon Cuer Lodge No 6984 had donated £100 to them. The Centre Fundraising Organiser for Maggies, Tom Hall, had forwarded thanks to the Leyland Group for their valued support. Walmer Bridge FC received a cheque for £691 from David and Debbie Topping of Longton Lodge No 6237. Joe Goggin was on hand to receive the cheque. 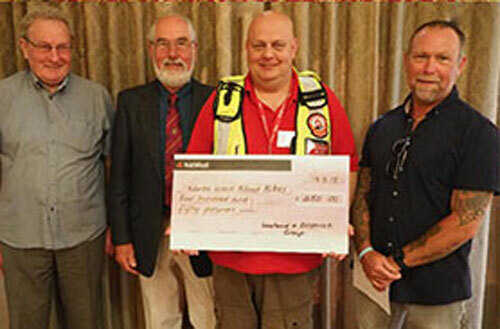 Pictured left from left to right, are: John Sidgeaves, Paul Boardman, Paul Hatton (receiving the cheque for North West Blood Bikes Lancashire and Lakes) and Carl Daggers. Speaking about the North West Blood Bikes Lancashire and Lakes, Stewart reminded the audience about the recent tragedy of Russell Curwen who sadly lost his life whilst carrying out his duties in transporting urgent samples. It was reported that Tony Harrison, our Provincial Grand Master, was delighted to hand over two brand new fully equipped motorbikes to the charity at a value of £40,000, funded by our own West Lancashire Freemasons’ Charity. Carl Daggers and Paul Boardman from Carnarvon Lodge No 2376 and White Hills Lodge respectively, presented a cheque for £300, having already donated £150 earlier in the year. Teddies for Loving Care (TLC) had already received cheques for £250 from Leyland Hesketh Lodge, £300 from Leyland St Andrews Lodge, £400 from Red Rose of Lancashire Lodge and £250 from the Order of the Secret Monitor. On the day, an additional cheque for £250 was presented by the Widows’ Sons and £120 from Chorley Lodge of Emulation, making a grand total of £1,570. Chris and Liz Hughes from Leyland St Andrews Lodge, Elaine Bruce representing the Widows’ Sons, Ian and Diane Heyes from Leyland Hesketh Lodge No 986, Dave Bishop from Red Rose of Lancashire Lodge No 9640, John Bicknall from OSM and Terry Fowler and George Askins from Chorley Emulation Lodge made the presentation. The Bradbury Scout Group was presented with a cheque for £200 and Mrs Margaret Eckton received it on behalf of the group from Phil Kavanagh of De Bon Cuer Lodge. A number of lodges donated the next round of cheques to St Catherine’s Hospice with the following amounts: £250 from Leyland Hesketh Lodge, £150 from Hesketh Chapter No 986, £250 from Farington Lodge No 7277, £200 from Leyland St Andrews Lodge No 7391 and £275 from Phoenix Lodge of Installed Masters No 9206. The New Start charity, a first-time recipient from the group received £150 and £100 respectively from Carl Daggers of Carnarvon Lodge and Chris Blackwell the group chairman. Natalie Kerr was on hand to receive the cheque and give an insight into their work. Pictured left: Elaine Close receives the cheque for Meningitis Now. Pictured right: Mick Croskery receives the cheque for Derian House. Bike Tours for the Wounded received £200 from Exuton Lodge No 7129 and George Askins and John Patterson presented the cheque to Michael and Kath Hoyle. Lostock St Gerards FC, also a first-time recipient, were presented with a cheque for £200 from Phil Kavanagh of De Bonn Cuer Lodge. Mick Rossall, club vice chairman, received the cheque and explained how and where the money will be spent. 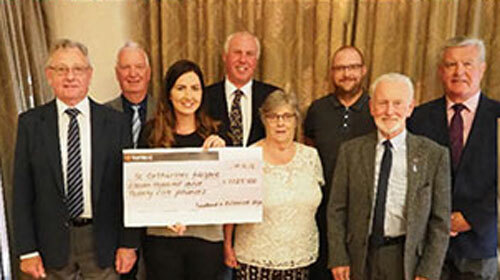 Meningitis Now had received a cheque earlier in the year for £400 from Hesketh Lodge Ladies Committee. At this event they received a further £1,160 from Longton Lodge, £500 from Old Huttonian Lodge No 7614, £250 from Hesketh Lodge and £120 from the Chorley Lodge of Emulation. Rosemere Cancer Foundation received cheques totalling £850 from Red Cross of Constantine Hesketh Conclave, White Hills Lodge, Leyland St Andrews Lodge and from Farington Lodge. Lancashire TAAG received £100 from Cuerden Lodge and £100 from the Leyland and District Group. The presentation was made to Leanne Corless of Lancashire TAAG by Ian Hainsworth from Cuerden Lodge and Neil Ward from the group. Derian House, who like St Catherines have benefitted from the Grand Charities annual donation, received donations of £500 from Old Huttonian Lodge, £200 from Leyland St Andrews Lodge, £150 from Hesketh Chapter, £200 from Farington Lodge, £500 from Euxton Lodge, £250 from Leyland Rose Croix Chapter and £275 from Phoenix Lodge of Installed Masters, making a grand total of £2,075. Dave Johnson from Old Huttonian Lodge, Dave Bishop from the Leyland St Andrews Lodge, Tom Oakes from Hesketh Chapter, Eric Nixon from Farington Lodge, George and Val Askins from Euxton Lodge, Mike Pinckard from Leyland Rose Croix Chapter and Brian Hoarty from Phoenix Lodge of Installed Masters presented the cheque to Mick Croskery. The Lewis Balyckyi Trust Fund once again received a cheque for £100 from Cuerden Lodge and £100 from the Leyland and District Group. The cheque was presented to Kevin and Jacqui Balyckyi by Stephen Lunt of Cuerden Lodge and Mike Pinckard of the group. Pictured left: The Widows Sons Masonic Bikers presenting a cheque to Bob Olive of Teddies for Loving Care. Pictured right: Carl Daggers (left) and Chris Blackwell present a cheque to Natalie Kerr and her little helper for New Start Charity. The next presentation was to Prostate Cancer UK who received a cheque for £250 from White Hills Lodge and £100 from Phoenix Lodge of Installed Masters. The cheque was presented to Andy Clarke by John and June Sidgreaves from White Hills Lodge and Brian Hoarty from Phoenix Lodge of Installed Masters. North West Air Ambulance again received an annual grant from the Grand Charity and on the day received a donation of £150 from Carnarvon Lodge and £50 from the Leyland and District Group. The cheque presented to Doris Rothwell was by Carl Daggers from Carnarvon Lodge and John Wrennall from the group. Friends of Ecclesholme were also beneficiaries on the day having already received a cheque for £100 from the Leyland St Andrews Lodge, they received a further £100 from the Leyland and District Group. The cheque was presented to Les Savage by Cliff Fazackerley from Leyland St Andrews Lodge and Dave Bishop from the group. West Lancashire Freemasons’ Charity have already benefitted from the group’s donations this year with £200 from Farington Lodge, £250 from Carnarvon Lodge, £200 from Leyland Chapter, £231 from Cuerden with Withy Chapter, £565 from White Hills Lodge, £150 from Phoenix Lodge of Installed Masters, £500 from Leyland Hesketh Lodge, £300 from Eccleston Lodge, £350 from De Bon Cuer Lodge, £379 from Leyland St Andrews Lodge and £375 from Euxton Lodge. Other charities who had received donations prior to the ‘Giving Day’ this year were; West Lancashire MCF 2021 Festival for £8,695, West Lancashire Freemasons` Charity for £3,500, Hutton Grammar School for £500, East Lancashire Masonic Benevolent Society for £200, Bleasdale School for £50. Pictured from left to right, are: Stewart Seddon with Shirley and John Rainsbury receiving a cheque for the Mayor’s chosen charities. 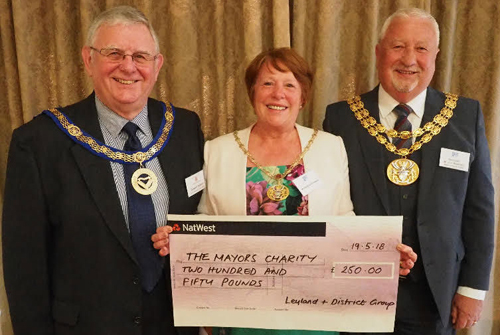 Finally, Stewart Seddon presented a cheque for £250 from the Leyland and District Group to the Mayor of South Ribble, Councillor John Rainsbury, which would be passed to his nominated charities. John gave a few words of thanks for the Freemasons generosity and he suggested that many of the recipients of these donations would be grateful, stating that these contributions will be life changing. Mike Pinckard, group vice chairman, concluded the days event by stating what it means to be a Leyland Freemason helping out all charities. To the recipients of the group’s donations he wished them the very best of luck and that all recipients benefitted from everyone’s hard work in applying such great donations. He thanked everyone for their attendance and hoped to see a continued support from the group over the coming year. Another successful day at Leyland Group Giving Day. Article by Andy Sumner and pictures by Glenn O’Brien.